Xray examination of fingers Posteroanterior Projection. Fractures and dislocation of the distal, middle, and proximal phalanges are can be seen, also distal metacarpal and associated joints are demonstrated. Some pathology processes, such as osteoporosis and osteoathritis if present is evident. Certain departmental protocols calls for one image to be centered and placed per CR imaging plate. A possible alternate routine involves a larger cassette used to include the entire hand for PA projection for possible secondary trauma or pathology and investigate other aspect of the hand and wrist. Oblique and lateral projection of the affected fingers only would be taken. Digits that cannot be extended can be examined in small section with dental films. When joint injury is suspected, an AP projection is recommended instead of a PA projection. When radiographing individual digits except the thumb (first digit). Extend the digits (second through fifth) with the palmar surface down on the unmasked portion of the IR. Separate the digit slowly, and center the digit to the midline of the IR. Center the PIP joint to the IR. Film can be divided into three for multiple exposure. Lead Masking: For multiple exposure. Shield Gonads by putting on patient' lap. Let patient seat at end of table, with elbow flexed about 90 degrees and with hand and forearm resting on the table. Separate adjoining fingers from affected side. Center and align the long axis of affected finger with the long axis of portion of cassette that is being radiographed. Central ray is directed to IR, directed to PIP joint. Collimate on four sides to area of affected fingers. 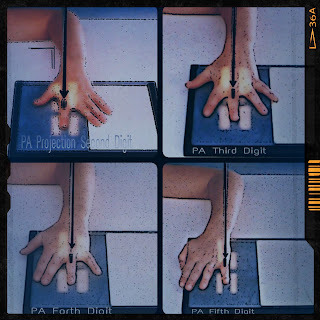 Ensure no rotation of the digits being examine. Fingernail (if evident or intact) is centered over the distal phalanx. Concavity of the phalangeal shaft has an equal amount of soft tissue on both side. Entire digit from fingertip to distal adjoining metacarpal are included in the radiograph. Bones are not overlap in open joint spaces of interphalangeal and MCP joint spaces. Soft tissue and clear bony trabecular markings.